Joseph Stalin was not renowned for his bon mots. Once, he was asked about the quality of the tanks, aeroplanes, and weaponry the USSR was churning out to fight the Germans on the Eastern Front. He replied that quantity has a quality all its own. For all his manifest other faults, on this issue the Man of Steel was spot on. Knowing the right amount to produce is tricky. This applies to books as much as anything else. Some books can be far too short (Three Men in a Boat), far too long (Atlas Shrugged) or just about right (Andromeda Spaceways Magazine). That the author knows how to tell what is “just about right,” “far too long,” and “far too short” can be the difference between a good and a bad book. In Literature®, has Guillermo Stitch found this balance? The novel clocks in at 140 pages and can be read in an evening. It has a great deal of worldbuilding to do. Is this long enough? The plot of Literature® is simple. A journalist Bobby is invited to work for a new company. While he is trying to make up his mind, the company and the police start making things difficult for him, following and threatening his family. Bobby’s girlfriend has recently left him, and his job is not going well. So he gets a gun and some contraband. Things go downhill from there. 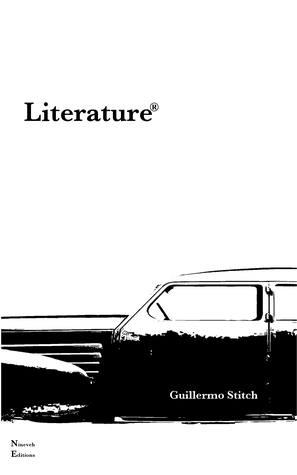 The world of Literature® is quite unique, and requires a lot of detailed description to bring out in all its complexity, either shown by the author or told through the character’s experiences. This world has the potential to make it stand out from other, run-of-the-mill adventure stories. There has been a world-changing event. Life has mostly returned to normal, except that now any kind of written fiction is outlawed (no mention is made of other fiction, either oral or video). Books and newspapers still exist, and digital media is still around, but only for factual reporting. Any form of fictionalised, written storytelling is not allowed. This ban is established early and soon becomes an enigma. Why has fiction been outlawed? Was it the cause of the earlier apocalypse? What even was the apocalypse? This seems a good mystery to hang the standard plot on, with the reader learning what happened while following the hero through the world. However, as the book progresses it becomes very clear the mystery will not be resolved. We never find out what happened, or why. If the novel has a constant, it is that nothing is explained. This is extremely annoying. The secondary concept that the author presents is that reading fiction produces energy – electrical impulses in the cerebral cortex which can be harnessed for the motive power of cars. The idea is a unique one, which leads to pleasant mental images of cars full of happy readers speeding down the highways and byways. Leaving aside “how” (steering would be a tricky proposition while reading), what is never explained is “why.” The society does not appear to have an issue with pollution or energy security, and the action takes place in a coastal city reminiscent of Los Angeles that is well serviced by mag-lev vehicles. The extreme measures the transport company takes to recruit the journalist seem over-the-top for a product that is not game-changing or life-saving. This sense of pervading uncertainty intrudes into the basic plot. The journalist, who is a closet reader of fiction, is offered a job writing fiction legally. This would appear to be his dream job in a world where fiction was banned. Instead he declines. Not, it seems, due to a feeling of revulsion or mistrust, but through a general sense of malaise. His girlfriend left him several weeks ago but for no reason that is explained his only clothing is his old prom blazer and puffy shirt. He has a full-time job, and spare time: he even has time to visit his mother in the middle of the day. Why he couldn’t head into Kmart and pick himself up a jumper at some point is unexplained. Because of his lack of believability, Bobby doesn’t generate any empathy from the reader, who is instead merely carried along by the fast-paced plot. The book feels unfinished, or half written. A first draft perhaps, that’s missing key character motivations and interactions. At the end of 140 pages, the reader may realise that Uncle Joe was right. Quantity does indeed have a quality all its own.